When Swords for Hire Development pitched the Villain Codexes to Outland Entertainment, we only envisioned three volumes, bringing us two evil-doers from each of CR 3–20. But villains have a way of foiling the best-laid plans. 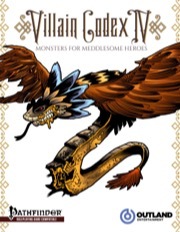 Villain Codex IV: Monsters for Meddlesome Heroes draws from iconic monsters in the Pathfinder Roleplaying Game (faerie dragons, treants, unicorns) as well as new favorites (gremlins and leshies) to expand upon the monstrous villains introduced in Villain Codex III: Enemies for Epic Heroes. 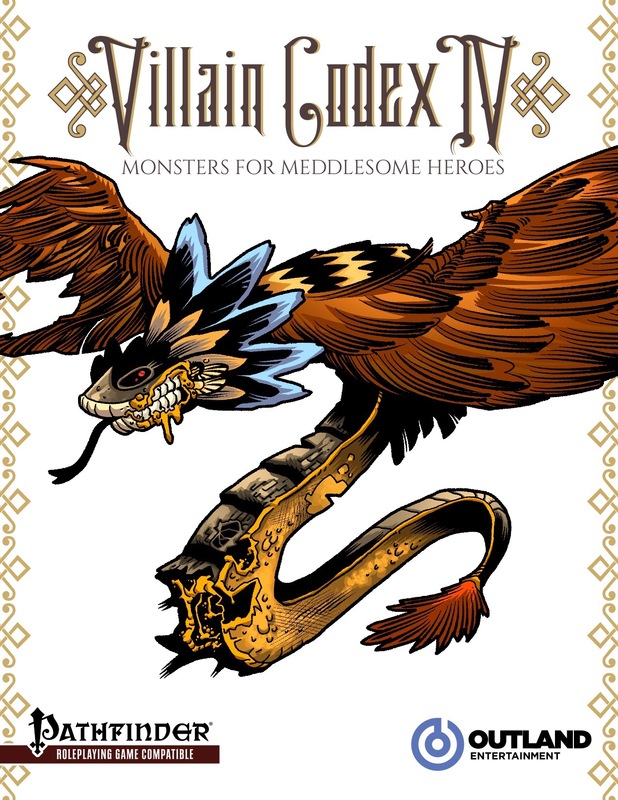 Villain Codex IV: Monsters for Meddlesome Heroes includes monstrous villains from CR 3-14. The fourth installment of the Villain Codex-series clocks in at 17 pages, 1 page front cover, 1 page editorial, 2 pages of SRD, leaving us with 13 pages of content, so let’s take a look! This review was moved up in my reviewing-queue at the request of my patreons. Okay, so we’re changing the formula this time around: Each of the characters featured herein is a monster with unique additionata – class levels, archetypes, etc. Analogue to the regular Villain Codex monikers, this book covers the middle level range: CRs range from 3 to 14. Each of the monsters herein comes with its own b/w-artwork and entry-wise, we focus on stats, though thankfully not to the extent, where this would be a traditional NPC Codex: The respective characters gain depth via the inclusion of goals and plots, which also act as inspiration for the GM. The respective entries note tactics, morale, etc., a nice feature that makes use of the NPCs herein easier. All right, general characteristics out of the way, we begin with Chudwix, at CR 3. Chudwix is a creature many PFRPG rightfully loathe – a pugwampi spiritualist (ectoplasmist) possessed by the spirit of an evil witch; his lash manifests as a spectral tooth and he bears the scars of a not always particularly amicable relationship. Kin of the Pumps gets a really badass artwork – the gourd leshy feyspeaker druid at CR 4, is a thief of food, seeking to animate scarecrows to end the blight upon the land that the civilized folks are to his mind. Smoke is interesting – the advanced worg thug rogue (CR 5) was always smarter than others and he has done a rather good job at keeping both his kin and goblins in line…but he is growing old; already middle-aged, it’s only a matter of time before a powerful alpha challenges his position. As such, he has had craftsmen create gear for him…but whether that suffices, only time will tell… Really cool angle here! Reyshu the Great, at CR 6, is a more straightforward monster/class pairing – we have a faerie dragon illusionist here, one whose artwork in particular struck my fancy – the chameleon/butterfly crossover is a cool take on the concept! He is a controller and sees himself as a benevolent guide for the stupid humans and their cruel tendencies…which can make him an uncommon, well-meaning adversary. Radnii, at CR 7, is an aranea unchained rogue and frankly sports the most disquieting aranea picture I’ve seen so far. Really creepy. Cool: We get both Halfling AND hybrid stats as well! She is, just fyi, operating a business that has invigorated the whole area…and who cares about a few strangers that go missing…right? Gramblethorne is amazing: At CR 8, the unfettered eidolon bloodrager sports one of the most amazing artworks in the whole series; the entity’s oversized head and hands and disfigured proportions are positively creepy. This is enhanced by the nature of the eidolon: Made to act in social situations, the eidolon hated the indignity and is pretty bloodthirsty. Yeah…definitely one of my favorites herein! Clovendell the Deathmare is a true villain: An unchained barbarian/ranger multiclass unicorn with the broken soul template, the once proud creature was broken by ogres; now covered in scars that weep, the mad unicorn wants to make others understand her suffering…and she has found a way to use the broken souls of giantkin to help her control massive humanoids… At CR 10, Khaalkthys of Jagged Teeth Cove , the blind sahuagin oracle has heard the voices of the Great Old Ones…and will do their bidding. Pretty classic combination here. Now pure badass and win would be Rimefyr. At Cr 11, we have a really cool critter, namely a young remorhaz ranger 2/skald 5. A) Remorhazes are kickass critters. B) With intelligence, base stats included and the added tricks, this fellow becomes positively nasty. Bid kudos for this fellow! Glenleven Linden (CR 12) is a druid (skinshaper) – while the subtlety component is pretty cool here she is yet another scarred treant killing off folks for burning down forests – you know, the motivation of more than 95% of treants adventurers face. Her methods are different, but I wished her story would be a bit more creative. Anyways, at CR 13, we move on to something more interesting: Azagog was bred as a living weapon – the awakened giant squid antipaladin is now raising idols to the Great Old Ones and considers himself their divine will. He is the most interesting take on the trope of the smart squid I’ve seen since Spires of Xin-Shalast. Now, the final villain herein would be Tezcatlopala – a CR 14 couatl lich sorcerer, born out of despair when trying to save her subjects, has become to consider herself a god; the nomenclature does evoke Tezcatlipoca, which is a rather neat nod, though I wished the feathered snake also had some additional mythological resonance there – where is the smoking mirror? Anyhow, that is criticism on a high level. Editing and formatting, as I’ve come to expect from this series, is excellent on formal and rules-language levels. Layout adheres to a printer-friendly two-column b/w-standard and the high density of neat b/w-artworks is a big plus – kudos to Ger Curti. The pdf comes fully bookmarked for your convenience. Kate Baker, Kim C. Frandsen, Nikolai Geier, Jeff Gomez, Joshua Hennington, Jennifer Jones, Mike Kimmel, James McTeague, Matt Roth, Loren Sieg, Jeffrey Swank and Robert Thomson have delivered a rather cool array of adversaries here. Mikko Kallio, Jacob W. Michaels and Mike Welham acted as devs, polishing the material, just fyi. So yeah, these adversaries are very much worth getting. The material is diverse, fun and challenging; the builds are interesting and for the most part, I also enjoyed the respective fluffy components. My complaints should be taken within the context of impressive creatures contained herein and not as disheartening. As a whole, I thoroughly enjoyed this collection of adversaries, and while a few of them didn’t blow me away to the extent of the others, this still deserves a heartfelt recommendation. Hence, my final verdict will clock in at 5 stars. Excited to see this published. It's the last of Swords for Hire's original books, and we had a lot of fun doing it and the series. Lot of talented authors here, as well. I was really, really happy with my villain for this volume. I got to indulge in two of my favorite tropes for her: Politely evil halflings and araneas! People really exercised a lot of creativity for these characters, and I strongly recommend checking it out! I've found books like this especially handy when running a game without much prep—each of these villains is basically their very own adventure seed. I already have plans for monsters from this book (just like previous books in the series) to spring on players of current Adventure Paths I'm running or prepping. There is a good mix here to fit many situations. Disclosure: I wrote Smoke - A warg with plans to be much more than a mount. I enjoyed developing these villains. The authors brought a lot of creativity to this volume. Reviewed first on endzeitgeist.com, then submitted to Nerdtrek and GMS magazine and posted here, on OBS, etc. Thank you, Endzeitgeist! I'm really proud of the authors who brought a lot of clever ideas and cool villains to the table.